At the heart of M3 Mobile product development is communication for uninterrupted data and information flow – so that goods reach their destination intact, orders are processed faster and employees (and customers alike) remain satisfied. That’s why above all M3 Mobile produces robust handheld computers which are designed to meet the challenges of work life. But you will also find payment systems and RFID readers in the portfolio of this South Korean vendor. 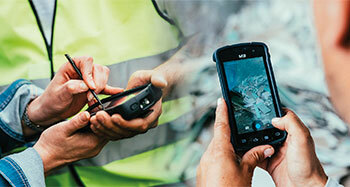 Since its founding in 2000 M3 Mobile has continued to develop itself, to always offer the best possible performance to users in challenging areas of usage. And to be sure about quality control, all devices are produced in-house. As a result of the high technical standards for which M3 Mobile is known, experienced technician teams monitor every step of the production process. Mobile computers from M3 Mobile are best characterized by their robustness. Whether there is a lot of dust, such as is common in warehouses and incoming goods, or high humidity, which is sure to be found in the field, every user will find a true, reliable assistant in his M3 Mobile computer. Despite their robust nature and high functionality, the devices are also known for their quick, simple initial training. Even new employees quickly familiarize themselves with the interface and use the mobile computers as intuitively as any other tool. Thanks to the extremely long battery life even shifts involving overtime are absolved without interruption. Discover the hardware from M3 Mobile now at Jarltech, your premium distribution partner. We deliver most of the articles directly from stock. Add to this warranty extensions, full coverage insurance, a pre-exchange service and other service offerings with which you optimally secure your investment - and all that with just a single mouse click. Get in touch with us today to discover which possibilities the M3 Mobile portfolio offers you. After all, communication is also at the heart of our work.